After spending the morning at the beach on Sunday I wanted to continue enjoying the beautiful weather that has finally showed up in Auckland. So I packed some snacks and we all hopped in the car and off we headed to Northern Helicopter Modellers Club flying site. What a neat site it was too. We drove out to Kumeu looking for a farm with parked cars and people sitting with portable tables tinkering with large flying objects. We sat and watched as people flew massive RC helicopters around a backdrop of lush green fields, sheds, grazing cows, and fences lined with wild flowers. I'm guessing Kien must have enjoyed the experience. He had his moments of watching the helicopters intently. It was also a bonus that we got to see tricopters and quadcopters also being flown around. I guess if you are into flying one RC thing you will be into flying other things too. We then headed out to Muriwai beach, but decided to go to one of the more secluded spots up the coast down Rimmer Rd. I love the west coast beaches in the Rodney district - fabulously wild with the wonderful sand dunes and Toi Toi dancing in the wind, and the forest for neighbours. Whilst Kien was asleep I went for a wander through the forest and found wild NZ spinach carpeting the ground. I used to grow heaps of this once upon a time in my garden and would use it like watercress. I made it back to the car just as Kien woke up, and we made our way over the sand dunes and down to the beach. He found a bottle on the beach, and that was basically his entertainment for the rest of the time we spent here. He filled it with sand, then kicked it around and emptied the contents only to start all over again. He threw it down sand dunes and slid down the hill chasing it. He continued chasing his bottle as we headed back. He threw it into the woods and scampered after it. He held on to it for dear life as he headed toward the car. It's still sitting in the backseat of the car. I'll have to recycle it when he isn't looking. Fantastic pictures and stories. There never seems to be anyone else around when you go to the beach, it's amazing. Thomas will find something too and hang onto it for hours, like Kien with the bottle. There is a tennis ball in Mat's car that Thomas found when he was about 11 months old, we can't bring ourselves to get rid of it. Jef and his jandals, haha, he'll be buried in jandals I bet. Does he wear them to work too? 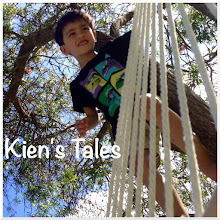 Kien looks very happy and healthy like always. I don't get this failing to thrive nonsense, he's a ball of energy and smiles. Looks like you had a fabulous time! Love your photos. Wish my photos would come out so good!